The Compagnia del Sacramento, which was formed in 1511, originally had an altar in the Duomo. They built a chapel off the right aisle in 1541. The inscription above the entrance records that it was rebuilt using a bequest from Girolamo Ortorio Paci. Construction took place in 1663-6, to a design by Giacomo Giorgetti. He also provided a design (1668) for the stucco decoration of the vaults. 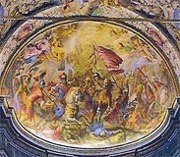 This oval fresco in the vault is attributed to Giacomo Giorgetti. ✴six panels of miracles associated with the Sacrament for the walls. 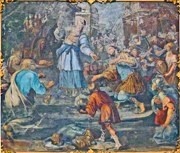 His involvement on site seems to have ended with the execution of the fresco (1673) of the sacrifice of Elijah above the entrance to the chapel, which is signed and dated by inscription. However, representatives of the Compagnia del Sacramento continued to write to the artist in Rome thereafter, and the frames of four of the panels on the walls bear his signature and the date 1677. 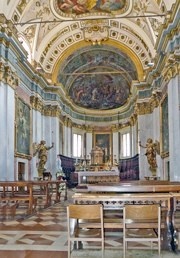 This fresco by Giovanni Andrea Carlone is in the lunette above the apse. When the Midianites threatened the Israelites in the wilderness, an angel commanded the judge Gideon to lead them into battle. The fresco depicts Gideon leading a force of only 300 men in a surprise attack in which the superior forces of the Midianites were defeated. Gideon then declined to become the king of the Israelites, saying that God would be their leader. This is a scene from a rather involved saga in the apocryphal Book of Tobit. Tobit was a righteous Jewish exile after the fall of Jerusalem who was accidentally blinded. He sent his son Tobias on a journey during which an angel appeared as his companion. The angel directed Tobias to catch a fish and use its gall to cure his father's blindness. The fresco shows Tobias catching the fish under the angel's direction. David is shown praying for an end to the suffering of Israel. God answered this prayer by granting him victory over the Philistines, and by promising him that he would found a dynasty that would last forever. This was later seen as the promise of the coming of the Messiah, who would be from the House of David. God tested Abraham by commanding him to sacrifice his son, Isaac. When Abraham was about to comply, God sent an angel to stay his hand and promised him that he would become the father of a great nation. The fresco shows an angel bringing bread to Elijah in the desert after he had been forced to flee from Jezebel. When David was forced to flee after having offended King Saul, he begged for bread from the priest Ahimelech. The priest gave him consecrated loaves because he had nothing else. The representation here shows this event as prefiguring the celebration of Mass. 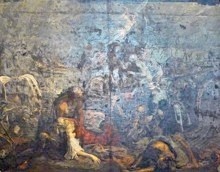 This fresco above the entrance, which is signed by Giovanni Andrea Carlone and dated by inscription, depicts the contest between Elijah and the prophets of Baal. Each prepared to sacrifice a bullock, and called on God to light the fire. While Elijah’s prayer was answered, that of the prophets of Baal was not. Thus the people returned to God and killed the prophets who had tried to lead them astray. This panel in the lunette on the counter-facade is signed by Brother Emanuele da Como and dated by inscription. ✴the bronze serpent on a cross, which God ordered Moses to make, promising that those bitten by it would be saved.